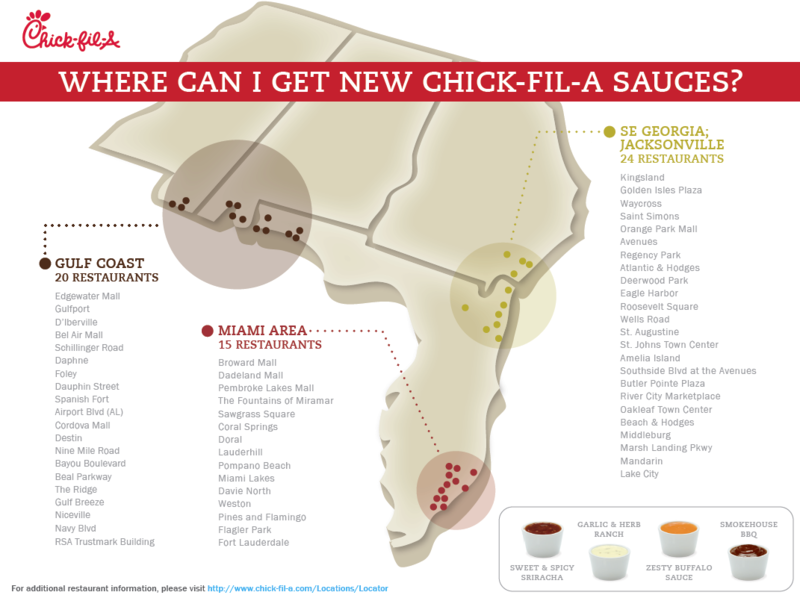 ATLANTA (September 21, 2015) – Chick-fil-A announced today the rollout of a new Sweet & Spicy Sriracha dipping sauce, and customers in South Georgia, Florida, South Alabama and South Mississippi will be the first in the country to taste the spicy new menu addition. The Sweet & Spicy Sriracha Sauce will be available in select restaurants in Jacksonville, South Florida, South Georgia, Mobile, Ala., the Panhandle of Florida and South Mississippi from September 21, 2015 to January 5, 2016, along with three new and improved sauce flavors: Smokehouse BBQ, Garlic & Herb Ranch and Zesty Buffalo. Chick-fil-A developed the sauces in a continued effort to meet changing customer preferences and flavor trends. The new sauces will replace the restaurants’ current Ranch, BBQ and Buffalo sauces. The original Chick-fil-A Sauce and Polynesian Sauce will remain on the menu. Earlier this year, Chick-fil-A announced that it would remove all high fructose corn syrup and artificial coloring from its sauces and dressings. Although only currently available in select South Georgia, Florida, South Alabama and South Mississippi restaurants, the new sauces are expected to be available nationwide by late 2016.